33% MORE PULLING POWER THAN PREVIOUS ACE LINE HAULER MODELS. Compatible with Scotty Downrigger mount Part No. 1023. Plugs into new or old style Scotty plugs. 110lbs shrimp or crab trap capacity. Pulls 1-4 prawn traps or 1 crab trap. 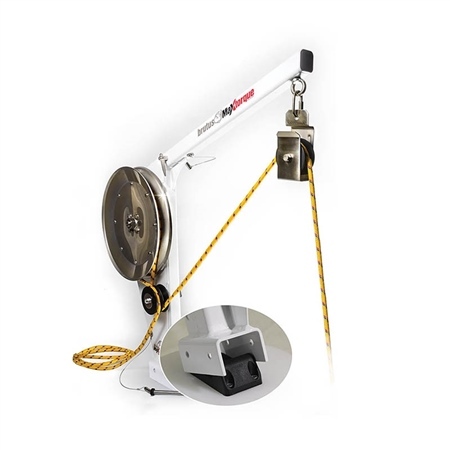 Pulls 140′ per minute (based on 1 trap per line). Draws only 14 to 35 amps of power depending on load. Collapsible frame; folds down in seconds for easy storage. Hands-free operation with the optional Bull Dog accessory. Easy to follow installation and operating instructions. Fitting Plate Dimensions: 60mm (W) x 125mm (L). This is for hobby use only and is not intended for commercial use.